Previously: "Joey's Hope - Part 1 of 4"
...Joel was gone to surgery and then to recovery on Friday from about 6:30 a.m. until 4 or 5 p.m. He was moved to the ninth floor of the Mary Brigh building in ICU. Dr. Bledsoe talked with Kimberly and advised that the surgery went well. Although he did advise that Joel experienced some seizures during the surgery. Jadyn and Kimberly were allowed to go see Joel for about an hour. It was not pleasant for anybody. He didn‘t look too great and said strange things. He had some seizures (in his hand) while they were in the room with him and Kimberly had to call the nurse. Joel remained in ICU for about 24 hours. 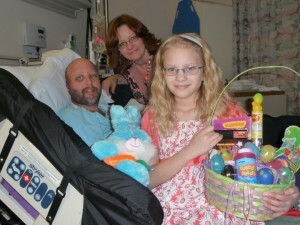 On Saturday, Jadyn and Kimberly stayed with Joel at the hospital most of the day. Kimberly noticed almost immediately that Joel was irritable and not quite himself, which is totally understandable having had brain surgery the day before. The next day was Easter Sunday. Kimberly and Jadyn attended Hope Summit Christian Church and then went to be with Joel. They brought him an Easter basket with some silly things inside. Joel looked through it, and again Kimberly noticed how irritable Joel was. He became easily aggravated at both Jadyn and Kimberly constantly. He had always been the most easy-going person you’d ever meet, rarely raised his voice, always smiled, always kind and considerate to others, and more. That Joel was not in sight! It was almost as if his entire personality changed. It was completely distressing to his loved ones and not a great Easter for the Saunders family that year. Joel was released from the hospital on Monday, the very next day! Kimberly was nervous to be responsible for his care. He had many appointments with various Mayo doctors over the next ten days. During this time Joel had several more seizures which frightened everyone. Dr. Lachance adjusted his seizure medication, and that helped. Almost three weeks after initially arriving in Rochester, Joel then had gamma-knife radiation on the remaining tumor in his brain. This was done as an outpatient at St. Mary’s Hospital. The very next day Joel, Kimberly, and Jadyn were allowed to make the 10 hour drive back home to Indiana! They were gone from home for around three long weeks which seemed like an eternity at that time. Joel was told he could not drive until he was seizure free for six months. That was quite a hardship on the family, but understandably necessary. Joel also had some problems with walking normal for awhile after the surgery. He seemed to have all his mental faculties, other than the noticeable change in personality. He had some memory loss and balance issues. Dr. Lachance assured us it was a normal thing to happen after brain surgery and that he would most likely return to his usual self. The Saunders family believe, to this very day, that our Heavenly Father was with them every step of the way during this journey. But they also know that, had they not had the foresight to take it upon themselves to contact the Mayo Clinic, Joel would not have had the appropriate medical attention that was required. Without a doubt the Mayo Clinic medical professionals saved Joel’s life! They are probably one of the most advanced medical facilities in the world. The Saunders family was astounded at the Mayo facilities in Rochester. Had it not been for them, Joel would not be here today! Next: "Joey's Hope - Part 3 of 4"